I talk about exercise every week on the blog. And I try to find new ways to get people motivated to find their own fitness drive. Because honestly, it can be super tough sometimes. Finding the time can be challenging, a new gym can be intimidating, and excuses can come on from every different direction. 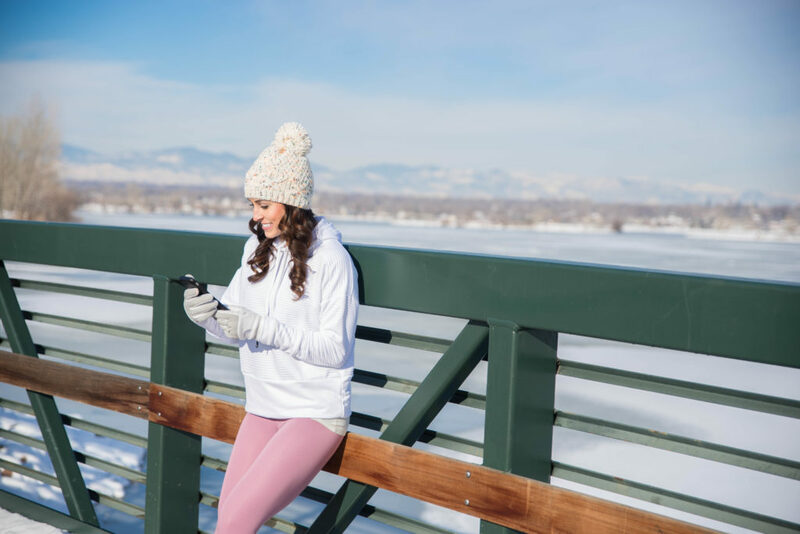 So when Nike approached me about working together to spread awareness about their Nike + Run Club app, I was so excited to share yet another way to get motivated and get moving in 2019! If you’ve been thinking about adding exercise to your 2019 routine but don’t know where to start, Nike is here to help. They want anyone and everyone to get moving, no matter your fitness level. So they put together a five month-long NRC Challenge on their Nike + Run Club app to help keep you motivated every single month. Each month you’ll be challenged to run a little bit more than last month, helping you stay on track and excited for your progress. When I first started my own fitness journey, I really didn’t know what to do. There were no apps back then or programs that I could afford, so instead I bought a pair of Nike sneakers and I just started running. Well, running and then walking, until I built up enough stamina to run the entire time. And to keep myself motivated, I decided to sign up for my first half marathon. This definitely kept me motivated since I was a college student and didn’t have much money to spare, especially on a race. But one of the best parts about the Nike + Run Club app and the NRC 5-Month Challenge is that it’s totally free! Instead of buying a gym membership or a personal trainer or even signing up for a race, you can save that extra money to spend on other things. And the app will keep you motivated day after day, month after month! All you have to do is download the app from the app store then get up and go. No buts or what ifs. The app will keep you on track, keep you entertained, and keep you excited about your progress! The Nike + Run Club app a ton of different ways to help get you moving. You can easily quickstart your run and it will track your distance with GPS. Or you can pick one of the guided runs depending on the amount of free time you have that day. You can choose from short runs, to intervals, treadmill runs, or distance based runs. And you can also join the monthly challenges for the next five months then track your history and achievements throughout the month. But one of my FAVORITE parts of the app is that you can run with some pretty cool people in your ear. Whether you want to get motivated by the athlete greats like Shalane Flanagan and Mo Farah or just be entertained by Bill Nye and Kevin Hart, Nike has a ton of different people to distract you and get you excited about the next mile or 10 miles! And not only can you run WITH Nike, but you can run IN Nike. And the perfect partner for the Nike + Run Club app is a pair of the new and improved Nike Epic React 2 Shoes! I’ve shared my love for the first Nike Epic React sneakers in the past because they are seriously like walking on clouds! The newest updated version of the shoe feels even lighter than the last and confront to your foot so effortlessly. I find this version even more comfortable than the last! 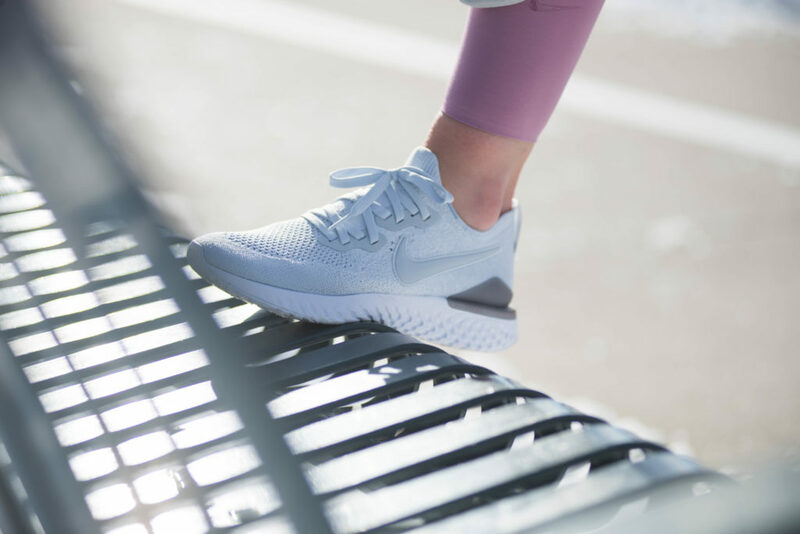 And since the Nike + Run Club app will give you the motivation to keep going, the Nike Epic React 2 Shoes will help make sure that every step feels as good as the last. They feel no different no matter how far you run, whether it’s your first mile or your eight mile! I’ve had a different pair since September and they feel the same as the first day I put them on! Plus the flyknit material moves with your foot to help you feel secure without excess pressure on the foot! 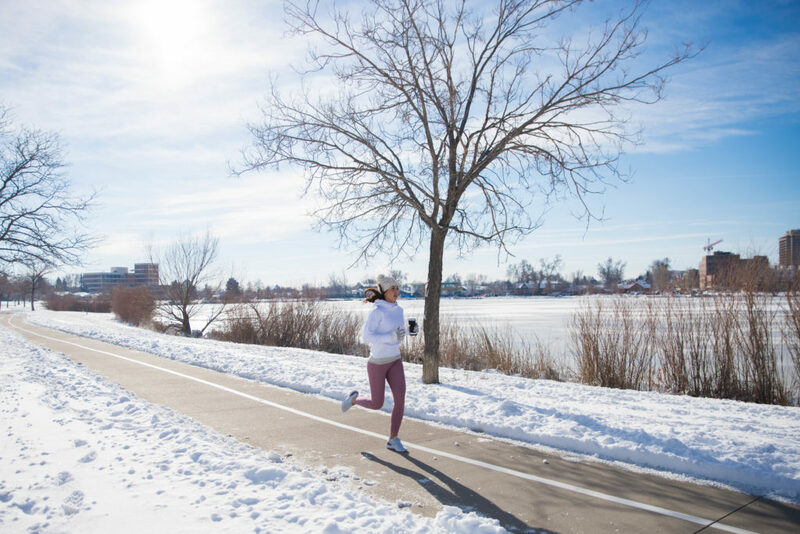 January is coming to a close, but that doesn’t mean that your motivation has to. 2019 is your year. It’s your year to feel your absolute best, to conquer things you never thought possible, and to become the healthiest version of yourself. And with the Nike + Run Club app and the NRC Challenge for the next 5 months, all your have to do is get up and go! Go prove to yourself that you can change your future, one step at a time. You got this! This post is brought to you by Nike. It contains some affiliate links and I may be compensated for this post, but all opinions are my own. This compensation helps with expenses to keep this blog up and running! Thank you for all your support! I agree 100% on the Epic Reacts, they are like clouds on your feet. I also didn’t know I needed such gorgeous pink tights before today! OMG these photos are amazing. You look like a winter goddess! Okay, am I just an idiot? I couldn’t find the challenge on their app! when you open up the app, there are 5 tabs at the bottom. click the second one from the right that looks like an arrow pointing down. right now there are 4 different february challenges to choose from!